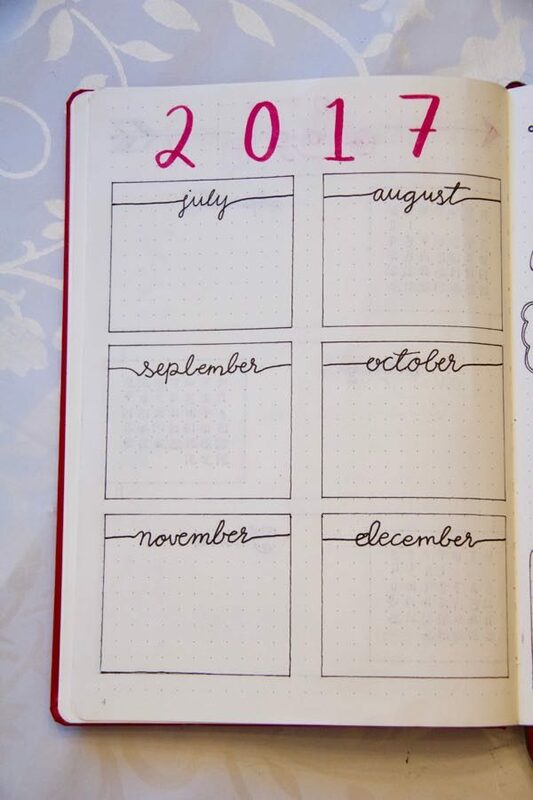 It has been a year since I started bullet journaling, you can check out my first bullet journal. It has been such a learning experience. I feel that I have grown so much and so has my bullet journal. 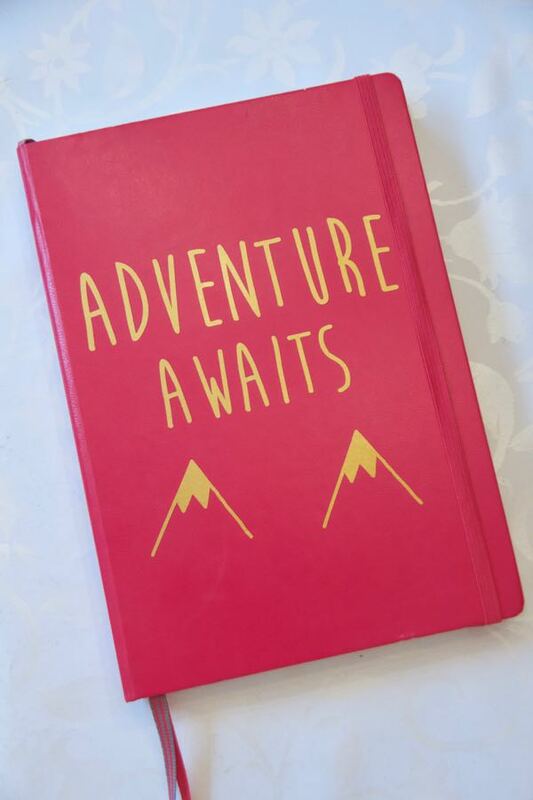 This is actually my third journal as the last two only lasted six months each. 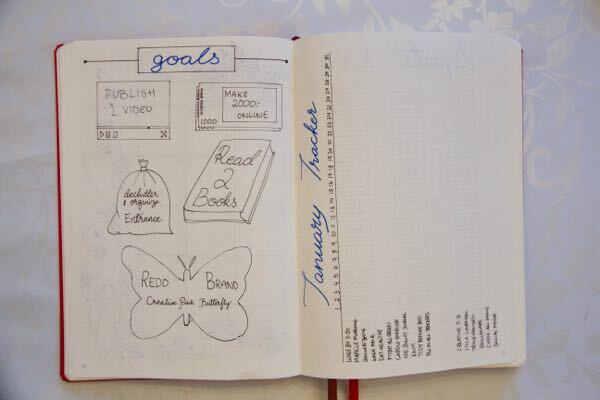 I really wanted to give you an update on how my newest bullet journal it. I would also just like to thank Pinterest and the Bullet Journal Junkies Facebook group for all your wonderful inspiration. * This post contains affiliate links. In plain English, this means that I may receive a small commission (at no cost to you) if you subscribe or purchase something through the links provided. Ps. For a list of my supplies, scroll to the bottom of this post. First of all, I wanted to introduce you to my newest journal, a Leuchtturm 1917, Dotted, in the colour Berry . I just have to say I love this colour! And I love the Leuchtturm. Its my first and will not my last at all. The only thing that I love better with the Moleskine is the number of dots (or spaces between if you will), they are just so much more mathematically friendly. 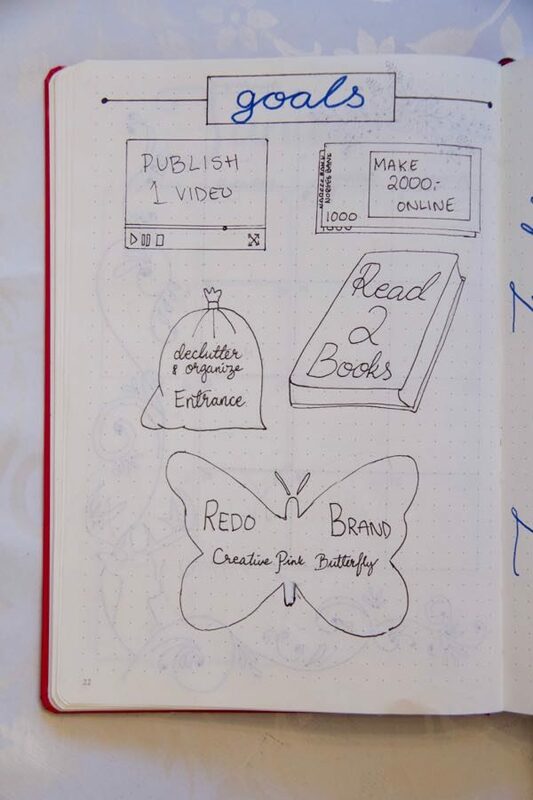 The Moleskine is 24 x 40 (I think) and the Leuchtturm is 26 x 38. But other than that I am super happy with my Leuchtturm. I also jazzed mine up with a beautiful gold decal that I bought from Etsy. 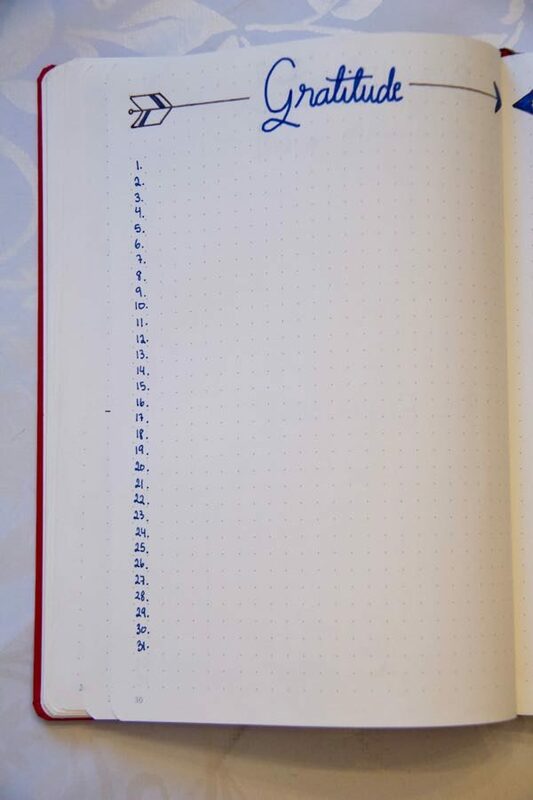 The first three pages in the Leuchtturm has a printed index. For my calendar I have specific colours for specific categories, I guess you can call them, and instead of writing them every month I decided to just write them down once and keep it handy for when I needed them. So I used some washi tape and stuck it in there, to easily flip out. This key is seriously my pride and joy. I do not know how many hours I spent with a pencil and then going over with a pen to make it perfect. Of course this was before I decided to have a “colour of the year”, and then instantly regretted the colour of my flowers. 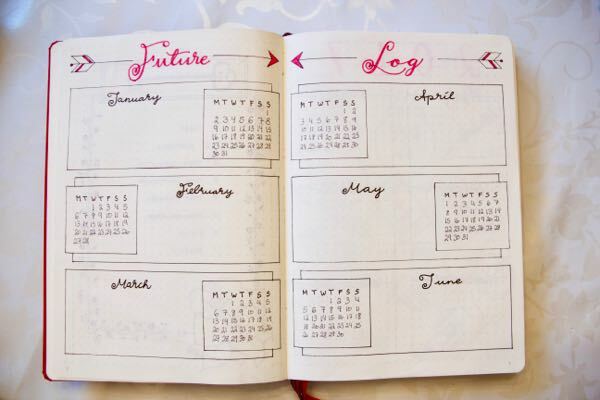 My first real spread was my future log. 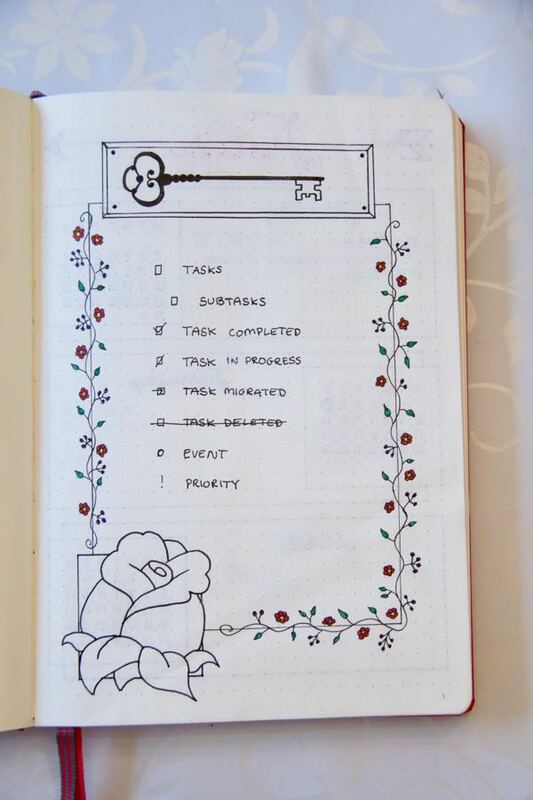 It looks more or less the same as my previous journal (and really far from my first), but I spent so much time setting it up last time, I really wanted to have it pretty much the same. Since I assume this journal will only last me half a year I wanted that to be really detailed. 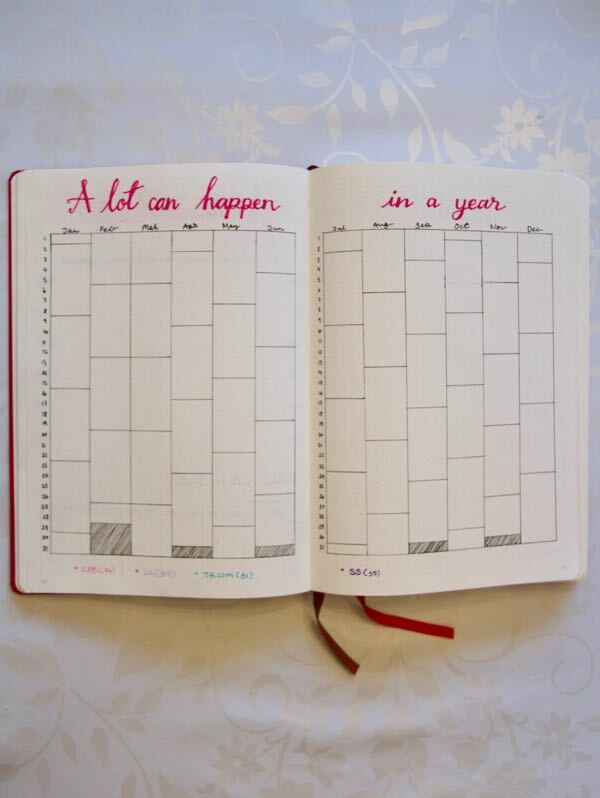 The next half of the year does not, so I decided to go really simple for that. I love this awesome page. It was inspired by my little sister (she will love me for giving her the credit) and I think its awesome. I would never have thought to make my goals this visual but it really helps me. 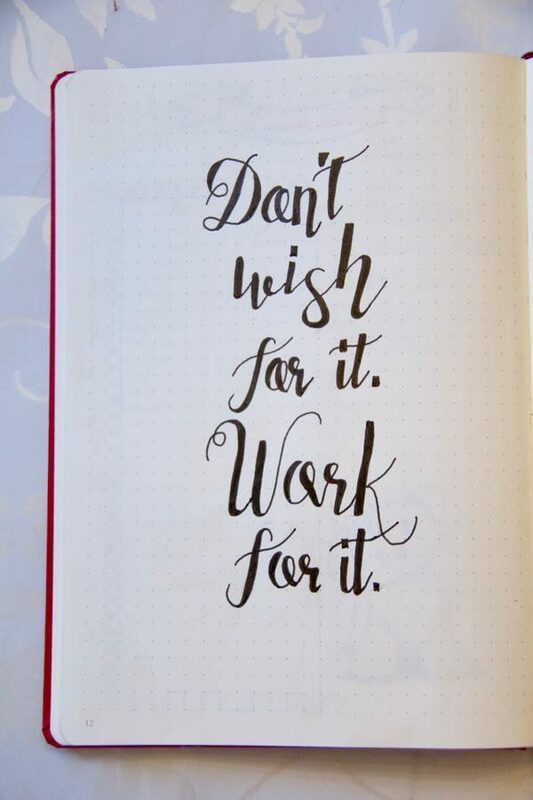 Plus I use it in my Miracle Morning to help me with the visualizing(If you have not heard of it, you should check out the book: The Miracle Morning: The Not-So-Obvious Secret Guaranteed to Transform Your Life (Before 8AM) ) My plan is to colour them in when I have completed my goal. I know some of them may be kind of vague but I am really happy with it. My next spread spread is actually one I have been super excited to do. For one entire year I am going to be evaluating my mood. If you scroll to the bottom you can see how it is when its been filled it. I also really wanted to add a quote here because I feel like it fits better instead of having a new spread. So I can feel inspired every day when I come back to this page. 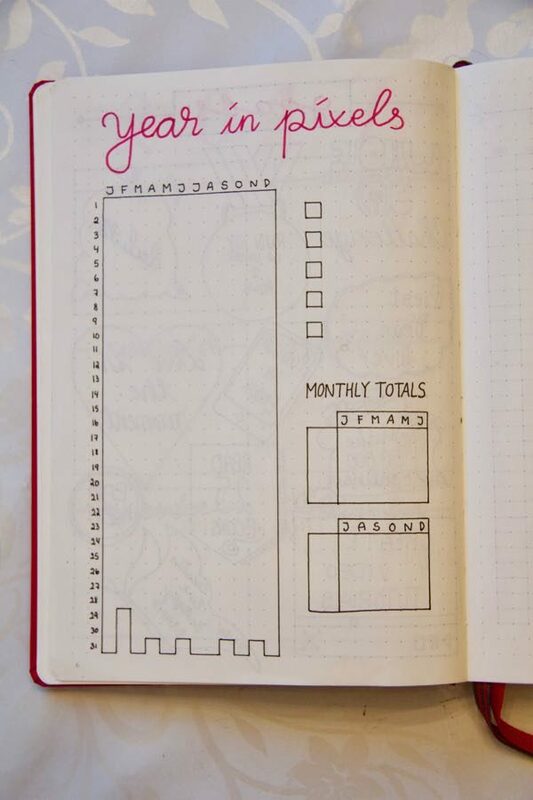 My personal tracker pages are next. I decided to put these together so that I can washi tape the pages together when not in use (in case someone wants to snoop in my journal. 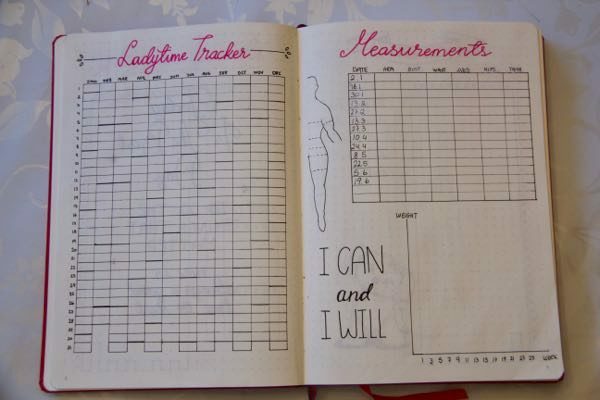 I have my ladytime tracker, and I honestly just love that name. But I have seen so many other names for it. 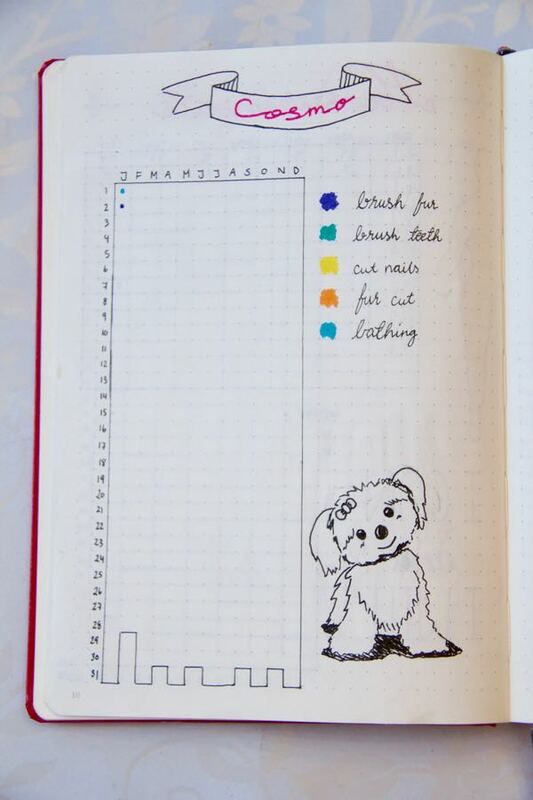 Yes, that is my pretty way of calling my period tracker. My Cosmo tracker must be my cutest tracker ever. As you might know, I am a doggy-mommy to my precious Cosmo. This little lady is so special to me and so she needs her own tracker. 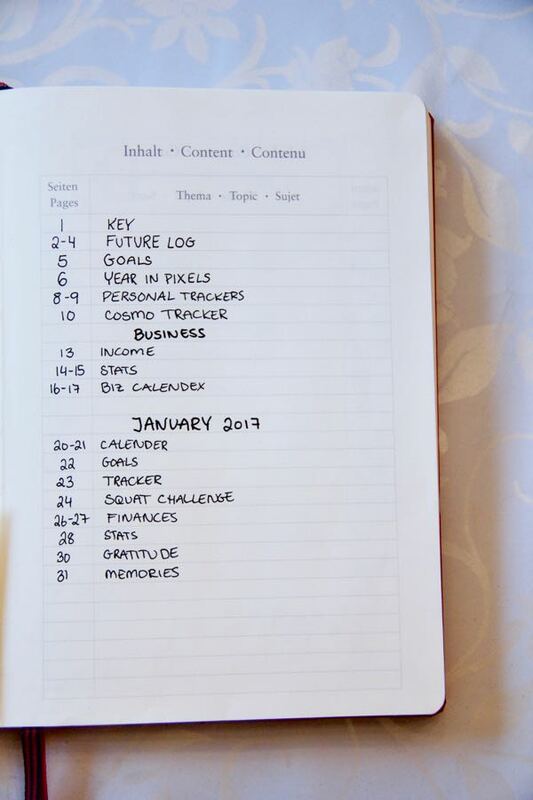 It is not for the everyday things, but just the things to help me keep a track of what gets done. As you can see I have filled in the first two days when this picture was taken. 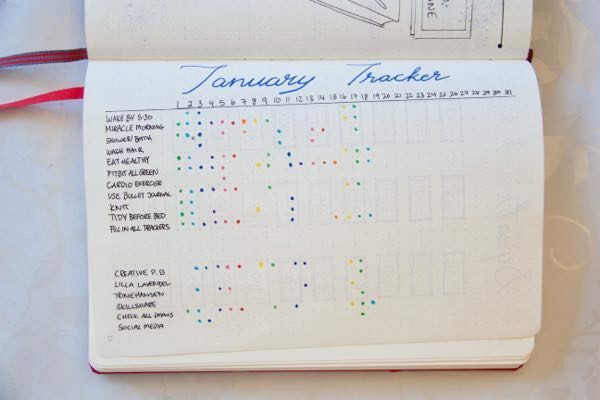 If I do more than one thing for a specific days I will make smaller dots next to each other. I am also thinking of adding a red “in heat” category. But I will figure that out in a few months when its her time. Previously I have had it with my tracker, but I think it will fit better her. That was the end of my personal part. Now its on to my business part. As you might know I am working on a couple of online ways to make money as you will see here. I also have some colour coded abbreviations CPB = my blog (Creative Pink Butterfly), LL = my Norwegian etsy type store (Lilla Lavendel), TH.com = my graphic and web design service (Trine Hansen) and SS = Skillshare a subscription based learning site, kind of like Netflix, but for classes. 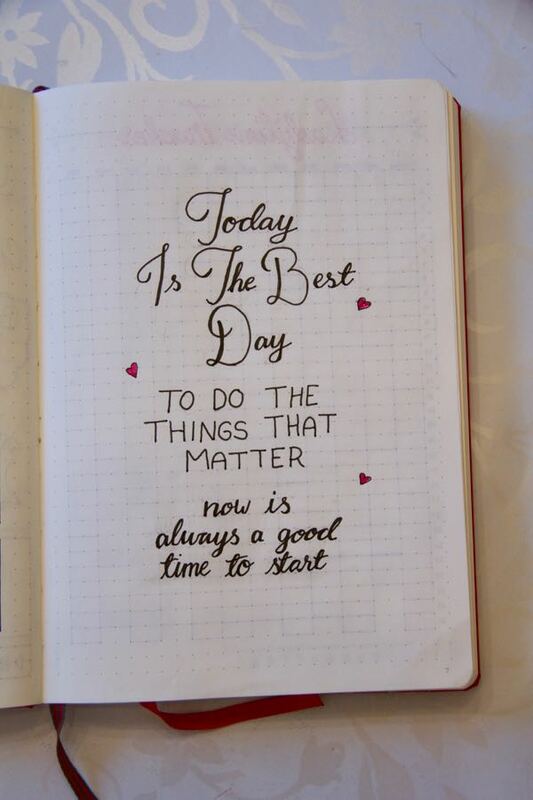 Starting it off with a quote! Now lets see who was paying attention. 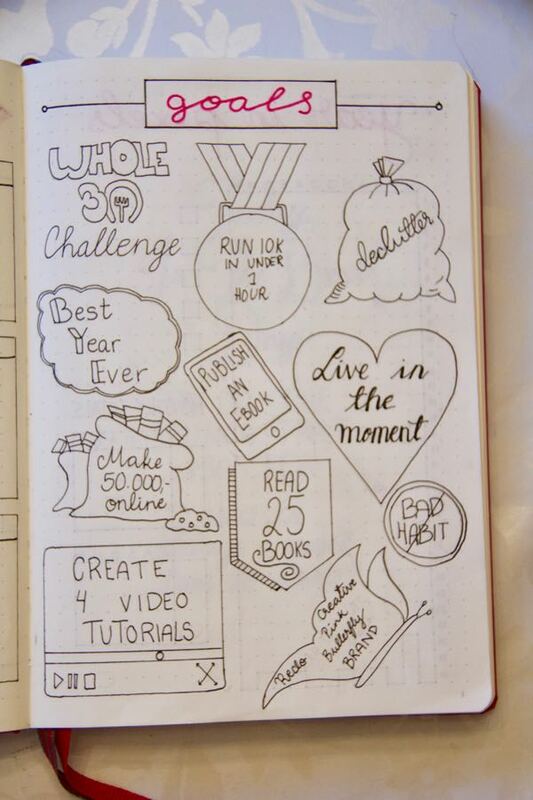 In my goals page I had a very overflowing money bag. It had a sum on it, in Norwegian kroner (NOK). Feel free to go back and check. 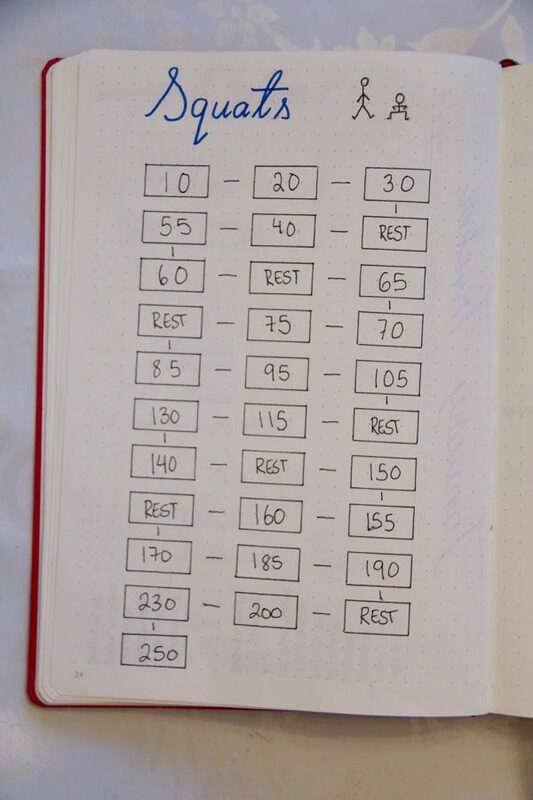 So here is how I am going to track it. I made this building block wall and every block is 200 nok, which is like $23, according to google today. 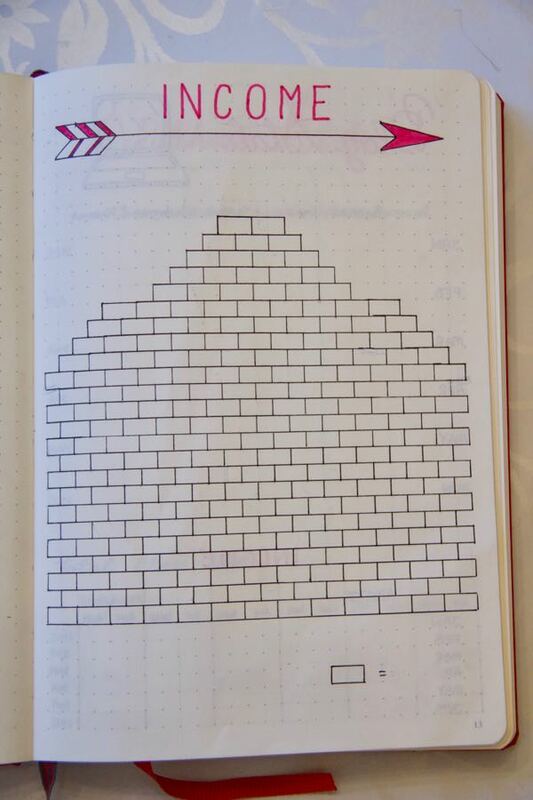 So are you a) scrolling up, b) counting the bricks and using some math or c) don’t care. Do not tell me the answer. So I am not sure how to fill it up yet. 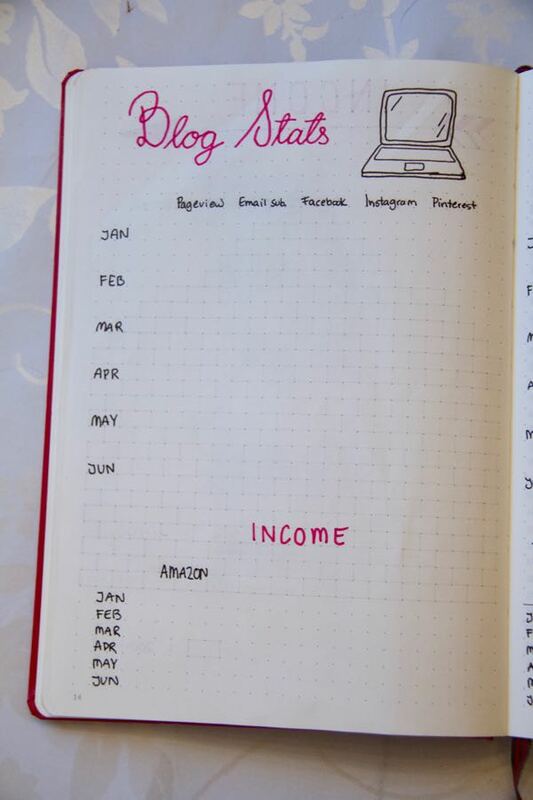 At the end of each month I fill it up with the monthly colour or fill it up with my colour coded abbreviations. 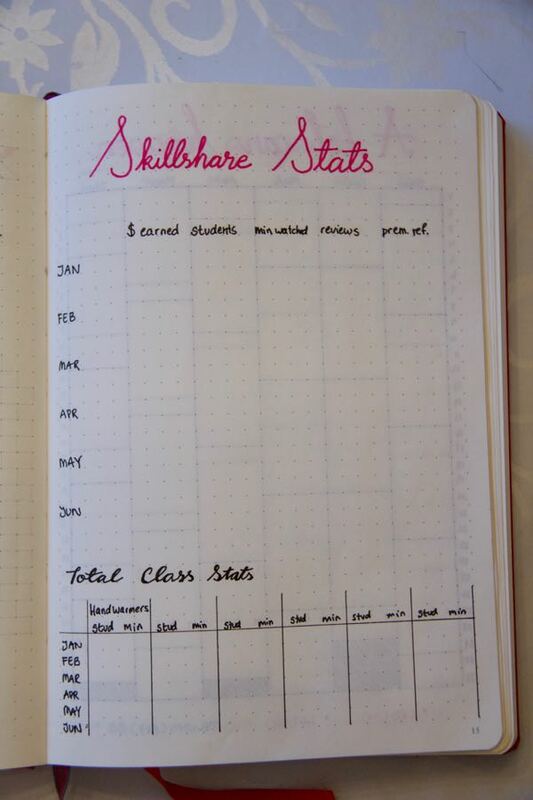 Next up it some stats pages for my blog and my Skillshare. Its super basic so not really sure how to go deeper. It looks pretty I guess and might be useful? My first Calendex. 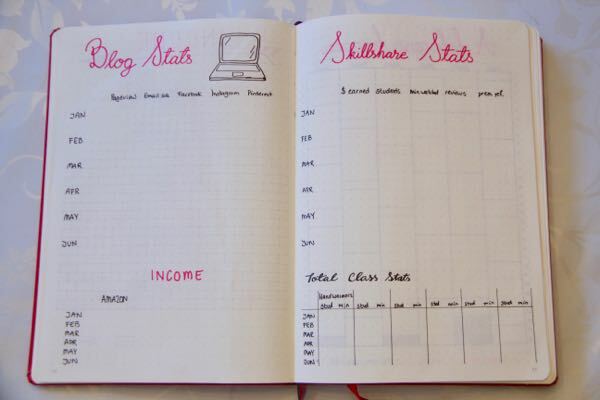 So I wanted to keep a track of how often I work on each of my online “thingys”. After much consideration, this is what I ended up with. So since my goal is to earn X amount of money I need to work on the things that make money. I feel like that guy in Love Actually, the guy who sings the Christmas song who proclaims his “love” for his manager… After he was at Elton Johns party. And he does that weird move thing. Anyways. Basically, every day I work on a thing I get the colour and add a dot in that date. 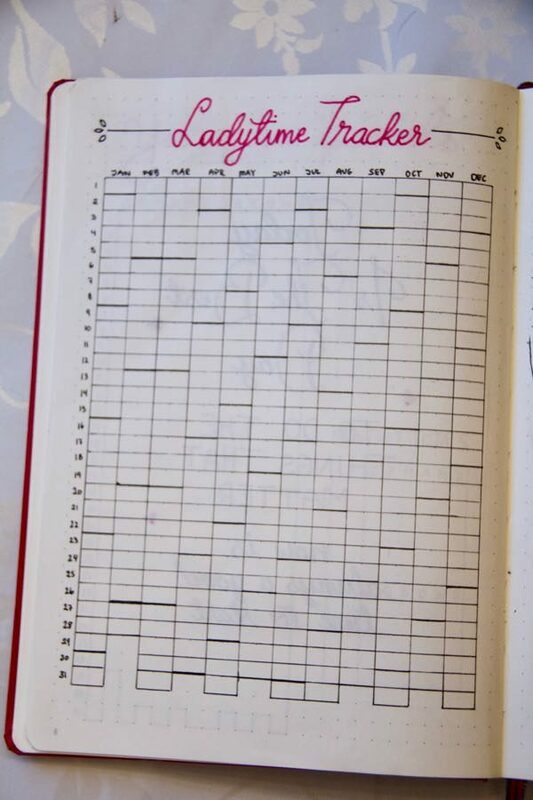 See further down for when I have started filling it out. And that is a wrap for my yearly trackers and such. 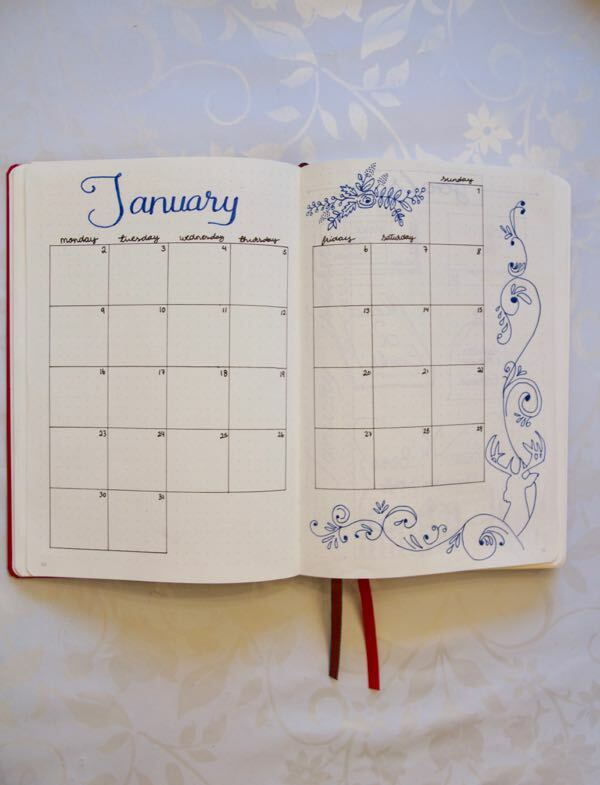 Now we are moving on to my monthly setup for January and after some of my filles in trackers. I love starting of my months with a big calendar. I prefer boxes to the one day per line option. Also, I decided to go a little further and actually decorate it a little. And I am so pleased. 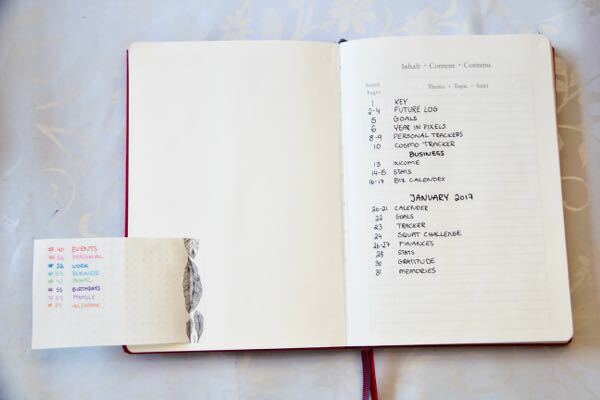 This is again where I use the colour coding from the flip-out from the first page of my journal. 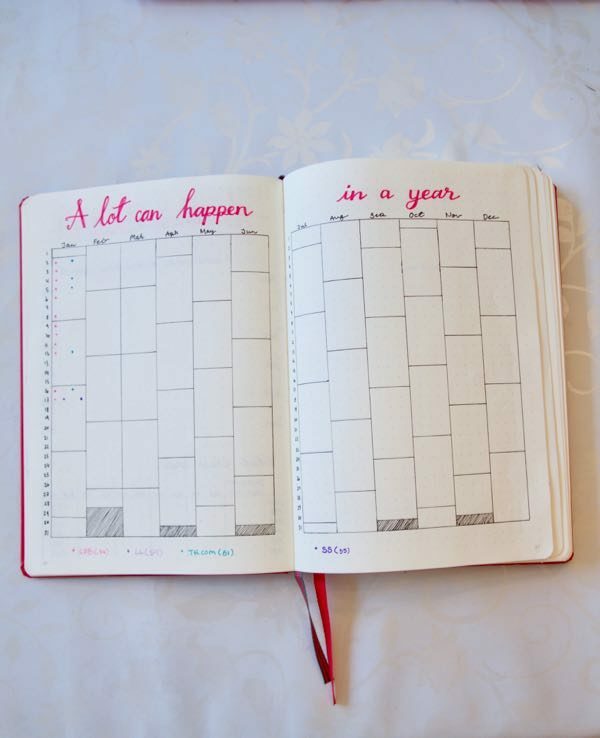 Since I want to actually complete my goals this year (last year I had 1/4 or 2/4) I want to work towards them every month. Again using these big visualizations. This just speaks more to me than just writing it down. Currently I have 1 + 1/2 + 2/3 + some done. 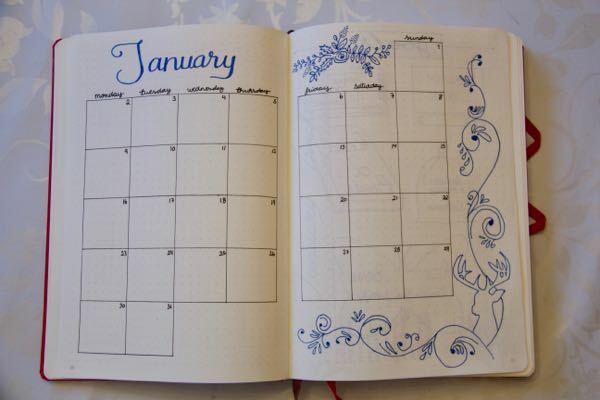 2/3 of the month is already finished so I really have to step up my game to complete on time. I know I can finish all, well maybe not two. 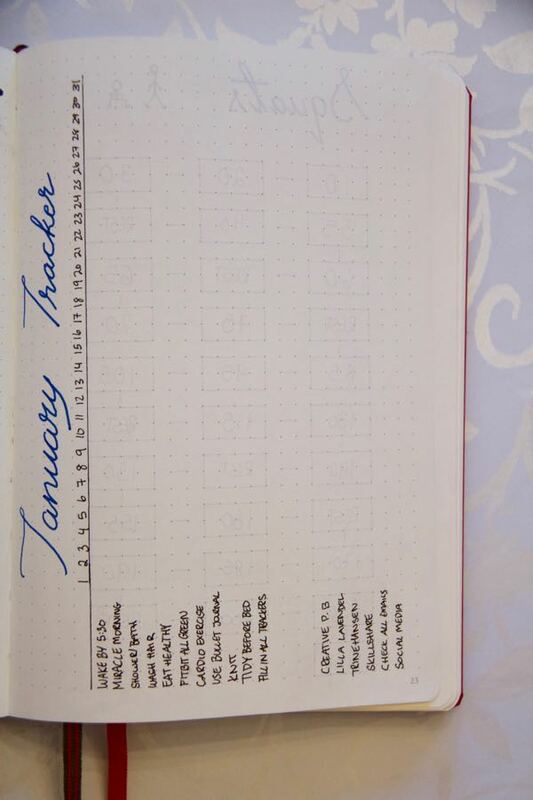 I also have my January tracker: some things are goal related and some are business. Some are just to make sure I don’t go too long between showers (kidding, kind of…). 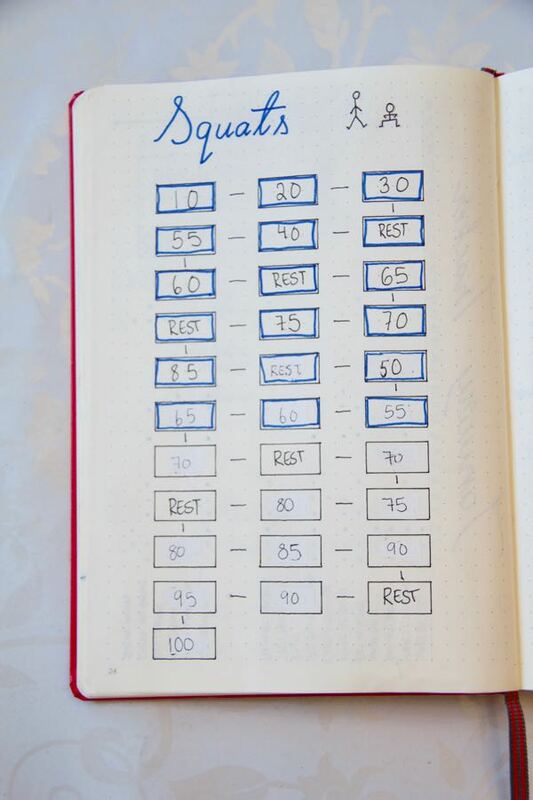 Next up is my squat challenge. If there was one thing I would have guessed I wouldn’t be able to complete it would be this spread. Well kind of I wont, I decided I needed a change of pace. The reason for these numbers is because that’s what my older sister did (totally got her into Bullet Journaling as well). But then I got some knee pain and decided that honestly, I nor will I ever nor do I want to ever do 250 squats. That will just bore me to death. So I changed it up a little. Scroll further down to see my final piece, and one I will be super happy to complete. One year ago I tried having these two in my journals and failed. I never tried memories again, but every gratitude has failed. 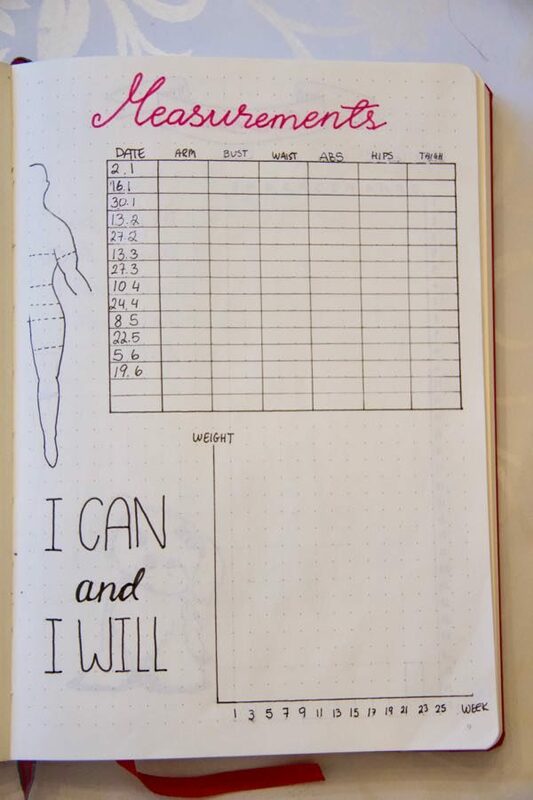 But this month I was back at it and I am so pleased to be able to say I am keeping it up! 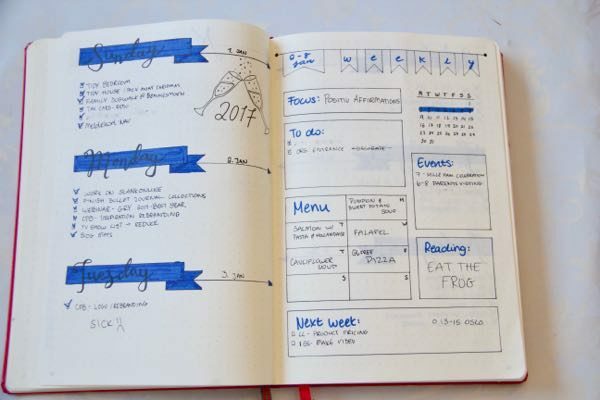 I also wanted to include how I use my bullet journal in my daily life. 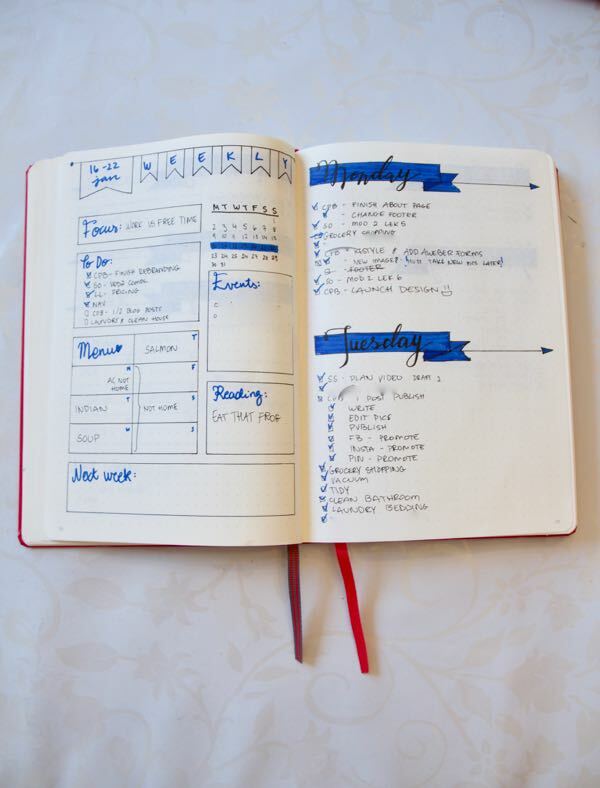 I have a weekly spread and a daily spread. uni pin pen – I have 5 different thicknesses from 01 to 08, they are amazing and all the black you see is written with these. pencil – I use a regular pencil before going my collections. ruler 20 cm – I got mine at a local bookstore. I do recommend the 20cm, I had a 15 cm before and it’s just too short. I hope you enjoyed my really, really, really long blog post. If you check ut the links below you can see more of my Bullet Journal related posts. Enjoy! 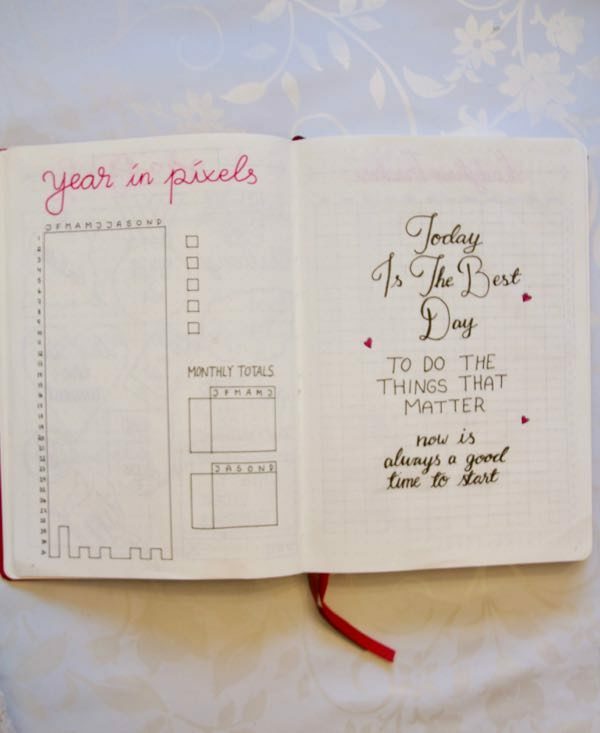 I’m enjoying looking at your bullet journal. I’m trying to start one for myself. Just don’t know where to begin. 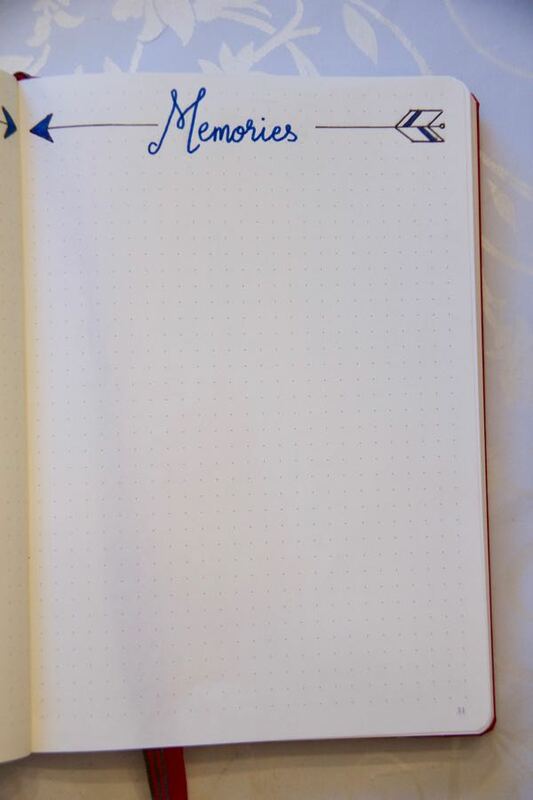 Just bought my first bullet journal and was looking around for insporation. Yours were super handy and cute! 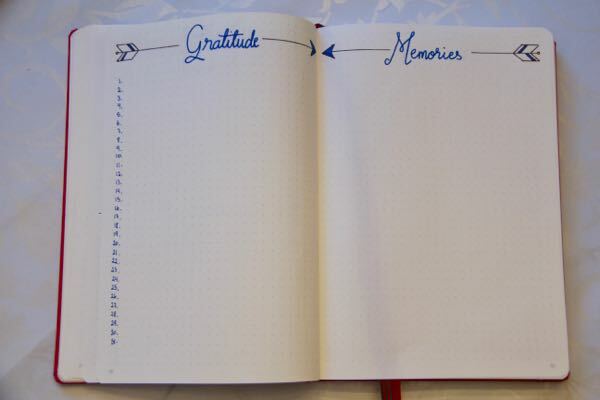 But I just wondered how you juse the gratituded and memories pages?